I recently decided to treat myself and get an oscilloscope. After much consideration I decided to go with an entry level Rigol. I liked the large number of positive reviews I was reading for these scopes all over the net (two examples here and here). After patiently waiting, unpacking and having a good play I can honestly say I’m impressed. Figure 1 above shows serial communications on my Reprap Mendel. This has been my test signal as I put the scope through its paces while I try to locate the source of intermittent serial communications problems. 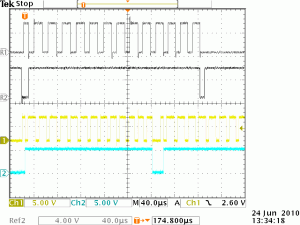 Having bitmap output makes blogging about electronics a whole lot easier. After having a few weeks play I have to say I’m a fan of the interface. I was pleasantly surprised by the center push feature on all the dials. A center push on the vertical position will center the trace about the zero point and a center push on the horizontal will center the trace about the trigger point. These are very nice interface enhancements that feel very natural and intuitive to use. The performance of the scope is great although I have not pushed it anywhere near the limits. To give you a better idea of what I am comparing this to I’ve compiled a list scopes I’ve used in the passed. These are scopes I’ve used in the workplace, spending countless days interacting with. Tektronics TDS 320 100Mhz – A nice digital storage scope (not LCD though), with the printer, GPIB and serial communication cards. Tektronics TDS 1002 60Mhz – An entry level, modern LCD scope but no printing or serial communication. Tektronics TDS 3000 series – DPO very nice colour LCD scope with floppy drive for saving waveforms to. This is the first scope I’ve used which I’ve actually forked out the cash for so I am very happy with my purchase and find it compares very favourably to those I’ve used in the past. This scope has more features than I’ve ever had before. The datasheet for the DS1000E Series is here. I REALLY Like the price. This scope cost me £420 including VAT, delivered to my door. I’d like to post a more complete review sometime, but I think there are already plenty of people saying the same as what I’m saying — A fantastic scope, unbeatable for the price. Using thermocouples with the Reprap Mendel is pretty straight forward, although I did overcome a couple of issues in getting it working. The MAX6675 chip can take up to 220ms to take a reading from the thermocouple and the reading begins automatically after the previous read. If another read is attempted before the current reading has been completed then the chip returns the previous value and restartsthe internal analog to digital the conversion. This means that if you read from the chip every 150ms or so you will always get the same first reading returned again and again. The arduino library code needs a 220ms delay between multiple reads to allow for the MAX6675 chip to take another reading. In the current state the library simply reads the same value repeatedly. Luckily it is a known issue documented on the project’s site and is not hard to fix. The taking of a single reading rather than taking a number of readings and averaging will contribute to a high noise level in the thermocouple readings when using this software. When testing the PCB with the library code everything works fine. The arduino returns a reading every second and everything looks good. When using the Reprap firmware with the thermocouple code it always returned the first value read from the chip (usually 24°C or so). This lead to things getting pretty hot as the extruder would turn the heater to full duty cycle while recording no change in temperature. I first looked at the SPI lines on the scope to see if there was excessive noise or some other issue. I also compared this side by side with the ‘working’ arduino system. The scope traces are shown below. The reference channels (R1 and R2) are the reprap firmware and the bottom traces (1 and 2) are the arduino. I noticed nothing wrong with the traces, they both looked very good. Reprap code compared to aduino library code communicating to the MAX6675. It was here however that I noticed that the arduino code calls another read to the chip immediately after the preceding read. After a bit more investigation I noticed that the library software calls the temperature reading function 5 times consecutively and always returns 5 identical results. A quick read of the data sheet confirmed the typical conversion time to be 170ms with a maximum of 220ms. 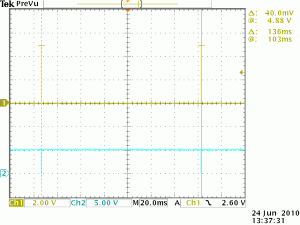 The arduino library starts a conversion just 20μs after finishing reading the last. 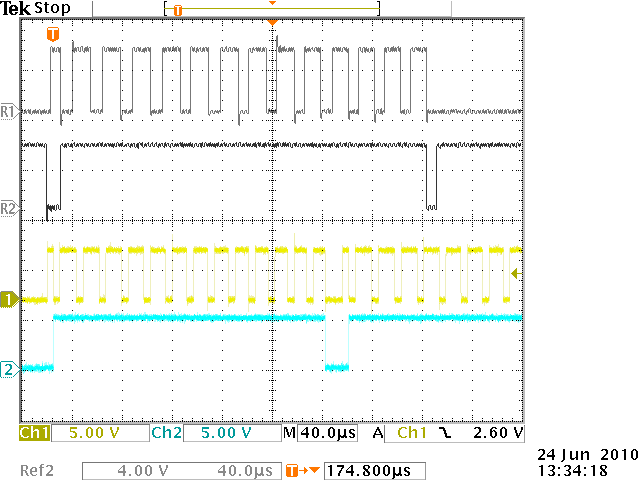 Reading the data sheet further also confirmed the action of restarting a conversion every time the chip is read. I monitored the lines on a scope and found that the Reprap software was indeed reading the chip every 136ms. To fix this I simply changed SLOW_CLOCK in configuration.h to 8089 from 5000. 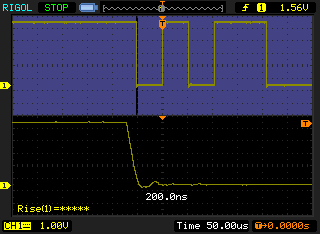 Based on the current delay giving 136ms, this gives 220ms delay between calls to the thermocouple chip. After making this change to the firmware the thermocouple now works perfectly. 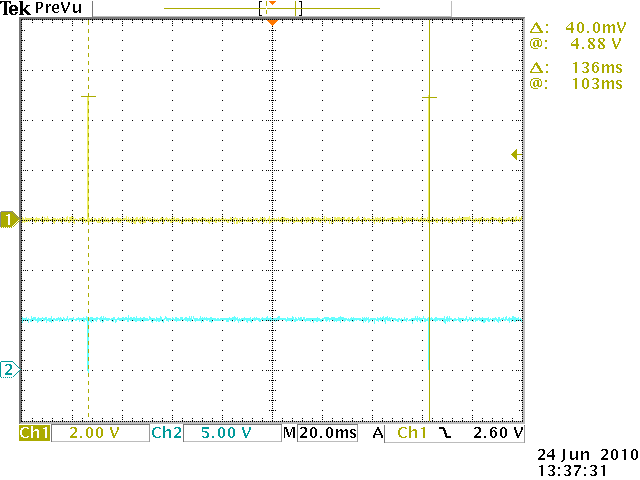 Time between calls to the MAX6675 thermocouple chip using the standard firmware on my reprap. A more robust fix to the reprap extruder firmware is shown below, but I have not tested this code yet. This simply exits the temperature reading method if enough time has not elapsed between calls to the function. The advantage of this is that the main loop can run as fast as it needs to without impacting on the operation of the thermocouple sensors. The arduino library can be improved by simply inserting the following at line 55 of the file MAX6675.cpp just before the end of the for loop. This will force a 220ms delay when reading the thermocouple multiple times via the read_temp(int samples) function. Alternatively you could use the millis() function to track the last time it was read and automatically delay the read by the appropriate amount. UPDATE: Nophead now covers this better in this post. In the course of building my extruder I chose not to modify my stepper motor. 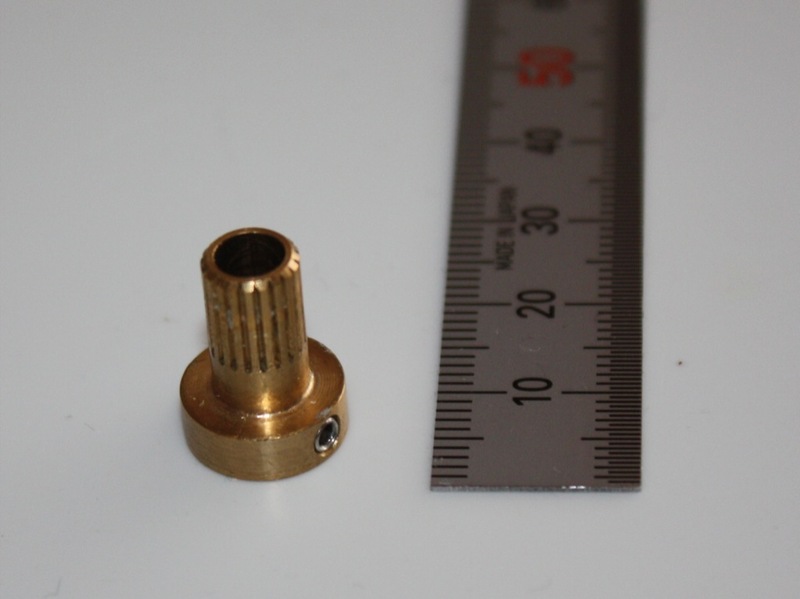 Instead of having a splined shaft on the motor I decided to use a splined pinch wheel similar to the brass M4 insert used in the geared extruder driver. My pinch wheel is shown below in Figure 1. By making some simple assumptions and using basic geometry I was able to calculate the necessary firmware parameter to accommodate my changes from the original design. Figure 1: Splined pinch wheel. It is designed to fit a shaft with a diameter of 5mm and is fixed in place using a M3x3 grub screw. I wanted to keep the motor unmodified so that it would be interchangeable with any of the other motors I’ve used on the reprap. The upside of this is that I don’t need to keep a separate modified motor as a spare just for the extruder. The downside of this is that the default value for E_STEPS_PER_MM used in the reprap motherboard firmware would not be correct for my extruder. E_STEPS_PER_MM is defined in the firmware documentation as “the number of steps that the extruder stepper needs to take to produce one millimetre of filament.” The firmware then uses this value to calculate the number of steps needed to drive the extruder in relation the print head’s current horizontal movement. 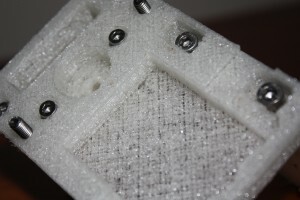 If this value is wrong then the reprap will push out too much or too little extrusion into the print. In the absence of any commissioning information in the official wiki for the reprap, once construction of the reprap was complete, I was left to adjust the value empirically. As I had no way of knowing just how different my untested design would be to whatever extruder was used to determine the values given in the code, I wanted another way to determine this value. 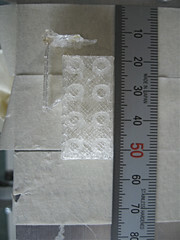 These calculations are used as a check to avoid wasting plastic and the possibility of breaking the extruder first time. To simplify things I chose to calculate the parameter by treating the filament and melted plastic as an incompressible fluid. This simplification should hold true once the system is in a steady state extruding plastic. If no material leaks out, is absorbed into the body of the extruder itself, or is vaporized, then logically the volume of material that goes into the system must also leave the system. This also assumes that there is no thermal expansion or any change in density of the material (which is what I really mean when I say “incompressible”). Figure 2 below shows a diagram of my greatly simplified model of the system. 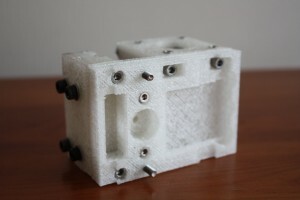 Figure 2: Model of the simplified system shown with the extrusion chamber shown as a grey box. Bear in mind that I’m not a mechanical or chemical engineer. I’m an electrical engineer, so my calculations and assumptions might be way off. If anyone knows a better way to model and or calculate this sort of thing, I’d love to hear from you. The volume that goes into the extruder is the cross sectional area of filament multiplied by the length fed in. This assumes the filament is a perfect cylinder. Assuming the filament is moving at the same speed as the outermost point on the teeth of the drive gear or surface of the pinch wheel then the length of filament fed in should be the same as the linear distance travelled by the outside of the pinch wheel. This is assuming that no slippage, no compression, and no deformation of the filament occur. A point on the outside of the pinch wheel travels a linear distance of one circumference per revolution. This is calculated by π multiplied by the diameter. The total volume entering the extruder per step is easily calculated by dividing the volume per revolution by the number of steps per revolution. If a gear reduction is used between the stepper and then the steps per revolution are multiplied by this ratio. In addition to the standard extruder I have also built a version of Adrian’s geared extruder. My version of this is shown in Figure 3 below. The ratio for this gear reduction is 5:1. I will compare this with the standard splined shaft extruder in the calculations below. 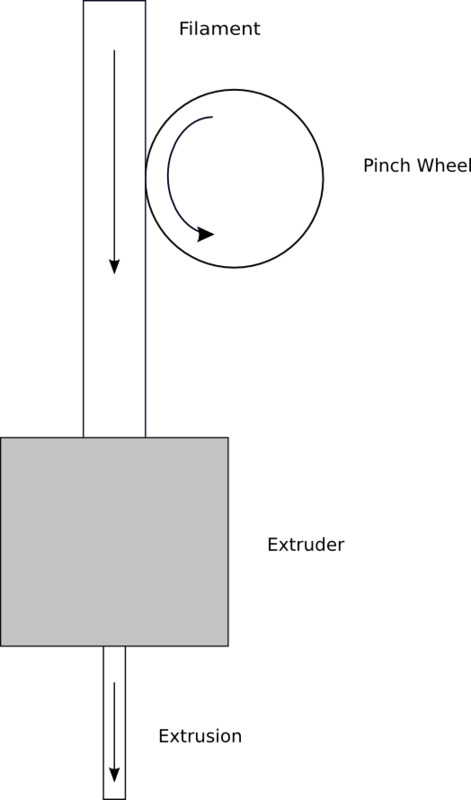 Figure 3: A geared extruder. 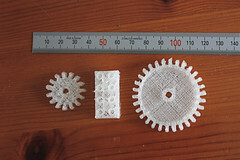 The large gear has 55 teeth and the small gear has 11 giving a 5:1 reduction. 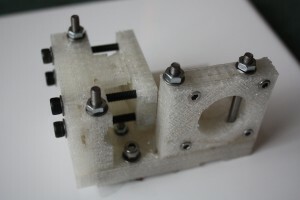 This means that for each half step of the motor the original extruder draws in 0.278mm³ of plastic. If the geared extruder is used then the volume of plastic drawn in with each step of the motor is an order of magnitude lower at 0.0885mm³. 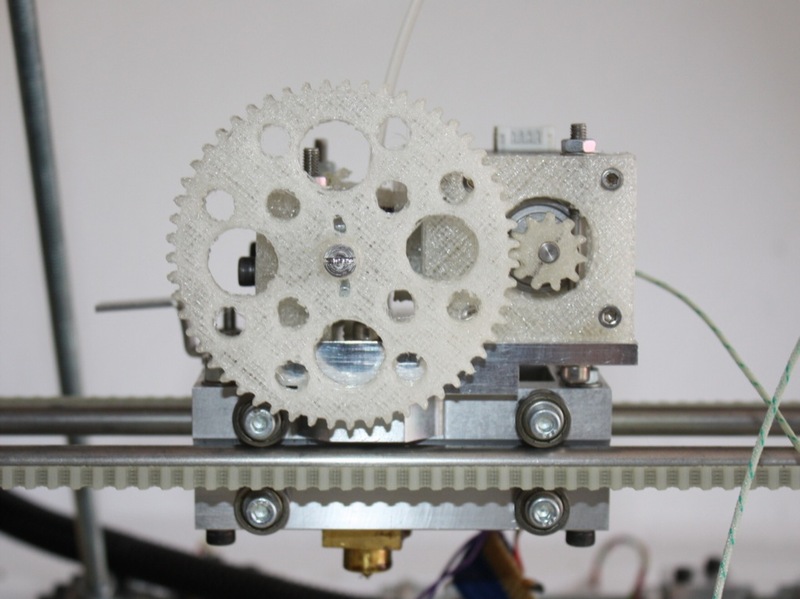 This means that the geared extruder should have much finer control as well as increased torque. 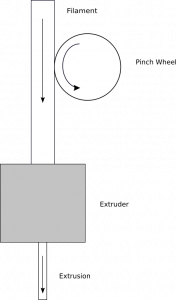 The output of the system is via a smaller diameter nozzle. Working from our main assumption, what goes in must come out, the system must extrude all of the material entering the system but with a smaller cross sectional area. Reworking our formulas from above gives us the length from a known volume. This assumes the extrusion, like the filament, is also a perfect cylinder. This is the length of extrusion output per step. By inverting this we get the number of steps per mm of extrusion required by the software. These values match up well with the values for the standard extruders given in the firmware. After reading through the working above you can see the result is proportional to the ratio of the square of the diameters and some of the terms will cancel out. Below in Listing 1 are my changes to configuration.h to automatically calculate the steps per mm based on the characteristics of the extruder. This is calculated when the main firmware is compiled. I’ve also created a google spreadsheet here to help calculate the same value if you just want the number to throw straight into configuration.h. These values form a good starting point for the inevitable fine-tuning which is required later. // needed. basically what volume goes in must come out. Any thoughts, comments and ideas are always welcome. 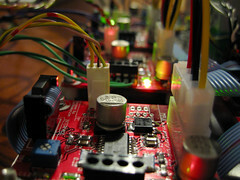 Last weekend I managed to blow up the motor driver chips on the reprap mendel extruder board. I did this by enabling the #FASTPWM option in the extruder firmware. I’m not sure exactly why this caused the chips to blow up, but what I do know is that the smoke got out and now they don’t do anything. I believe the problem was that either the PWM wasn’t working at all or that the current in the motor windings was not able to decay enough in the time allowed for by the faster PWM frequency. I have been investigating using a standard v2.3 stepper motor board to drive the extruder motor but I will need to modify the motherboard firmware to get it working properly. 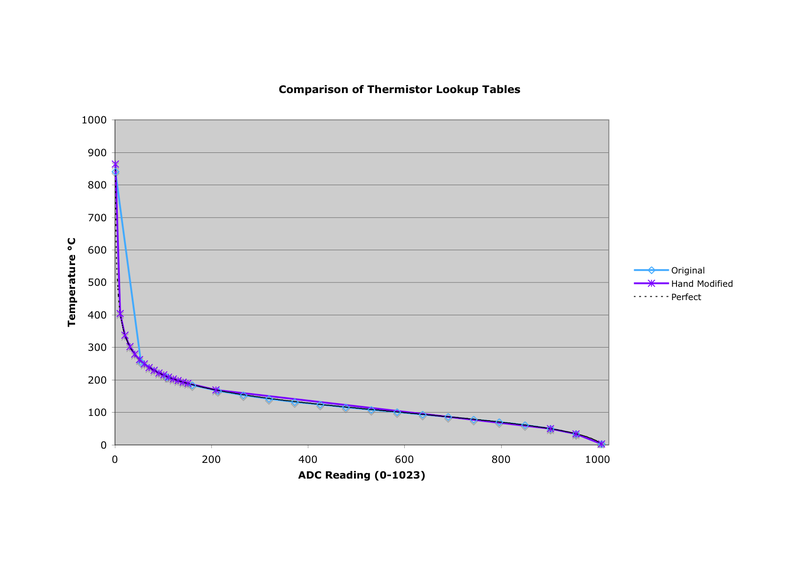 While poking about in the extruder firmware I noticed that the thermistor lookup tables could be improved. Currently I have been extruding my PLA at 250°C for reliable results. Looking at the standard lookup table, 255 is the second entry which means that most of the look up table is spent defining temperatures much below where I really want the most accurate temperature readings. By choosing the points more carefully and tailoring the spread we can achieve better accuracy where we want it. This is most clearly seen when the table is plotted. Figure 1 above shows a hand modified table as compared to both a perfect table with 1023 values and the standard table. If you look at the difference between the perfect line and the standard line you can see that above 255°C the graphs diverge significantly. What does this mean? It means that an actual temperature of 270°C will appear to our controller as 400°C. While this probably won’t make a large difference to the control of temperatures below 250°C it would be nice to know the system is accurate right up to 300°C. Changing the table may also improve the response of the control system near 250°C and reduce unexpected behaviour. An example of this might be when the system is set to 255°C and overshoots by only 5°C, the system will compensate for a measured overshoot of 20°C. The Python script used to generate these lookup tables first generates an even spread of ADC values that the software will see and then generates the corresponding temperatures. While this approach generally gives a great conversion across the entire range of readings, it’s not the best use of the lookup table for this particular application. I’ve edited the script to reverse the process and select a number of temperature points where we are interested in and then look up the corresponding ADC values to match. This results in a table (shown in Table 1 above) that ensures the 200°C to 300°C range has plenty of points and the sub 100°C region has the minimum required. The modified Python script is here. Unfortunately I broke my last thermistor while building a new extruder heater so I haven’t been able to test the new table. When I get a replacement I plan to check the results with a thermocouple to ensure accuracy across the range. A new heater and better printing. When I was ordering the parts for my reprap last year I accidentally ordered some thermistors that were only rated to 150°C rather than the 300°C of the recommended part. I can’t remember if it was just an oversight or I was swayed by the fact that they were only £0.58 each as a opposed to £3.99. After realizing my mistake I ordered the correct part but assembled an extruder using the thermistor at hand out of both curiosity and impatience. The results of initial testing were quite good (see this post) and the initial prints seemed acceptable. I decided after printing Adrian’s geared driver it would be a good time to rebuild the heater of the extruder using the glass bead thermistor. Photo 1: The charred remains of a thermistor 100°C outside its comfort zone. 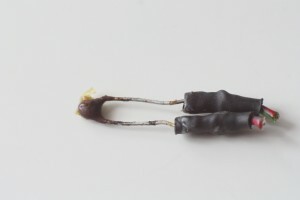 After removing the resistor from the charred heater (pictured above in Photo 1) one of my main concerns with the heater was that the polyimide tape was often melting and giving off fumes. As I was only heating to 220°C at most according to the extruder control board then either my tape was not the Kapton™ tape it said it was or the thermistor was reading the wrong temperature. I’m not sure that the wrong temperature was due to the bad thermal contact with the nozzle or the fact that I was operating outside the recommended temperature range. The new thermistor is much much smaller (0.8mm diameter (Ø) as opposed to 6.3mm Ø) and so should be much closer to the heater barrel and able to achieve much better thermal contact. Once rebuilt, tested, the extruder firmware reprogrammed for the new thermistor look-up table, and the sanguino motherboard reprogrammed for the new extruder drive I started printing some test parts. 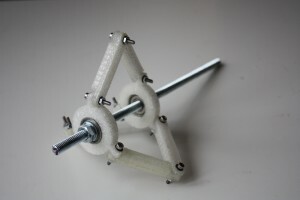 The test parts are from a design I’ve started for an adjustable hub for use in feeding filament into the reprap. I had found that with the previous heater I was able to extrude reliably at temperatures around 200°C – 220°C. With this new thermistor in place I needed to heat the system up to 250°C to get comparable results. 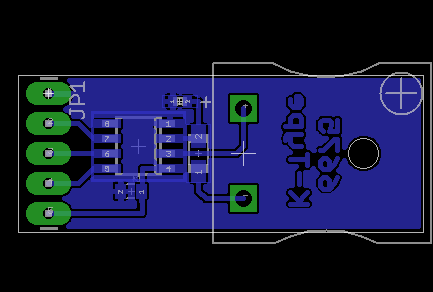 I hope to get a thermocouple sensor at some point to confirm the actual temperature of the nozzle. My preliminary testing at temperatures below 100°C show the tip of the nozzle to be about 50°C below the temperature read at the thermistor. I am unsure if this is due to sensor error or simply heat dissipation along the heater barrel. Once up and running though I did get some parts printed, but only after a couple of runs that ran out of steam half way through. The photos below show examples of the good and the bad prints. To get a sense of scale the spindle is M8 threaded rod and the screws holding the struts to the bearing holders are all M3x20. The bearings a 608ZZ (AKA skateboard bearings). The usual problem I find with my prints going wrong is that they print perfectly for the first part and then the extruder just runs out of heat and the extrusion becomes quite lumpy. This I normally try to fix by increasing the temperature. This works to an extent but costs you in quality as the extruder begins to ooze uncontrollably or simply extrudes too much filament. After the initial prints I built up a second heater barrel using the same type of thermistor and confirmed the temperature behaviour and performance to be the same. The new extruder driver certainly has plenty of torque and I feel it could almost push through the filament cold. I must admit I had my doubts about the design when I first looked at it and printed out all the parts. There didn’t seem to be enough parts to hold all the bearings in place, and the 55 tooth gear seemed a little loose and unconstrained in its positioning. After building it and threading the filament through I am impressed. The brass insert from Conrad Electronics really does grip the filament well and the gears mesh beautifully. It is also worth noting that I initially overlooked the last instruction in the build, to use some silicone grease on the gears, but it does make a dramatic improvement in the gears ability to mesh nicely, smoothly and quietly. I did deviate from Adrian’s design slightly. As my motors have a 2mm Ø cross drilling on the end of the shaft, instead of filing the end of the motor shaft flat, I drilled a 2mm Ø hole through my drive gear and used a spring tension pin to retain it. I’ve also made one other change to Adrian’s design. 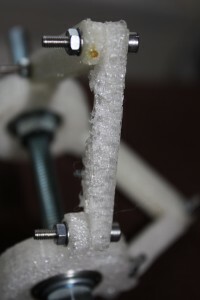 I can’t stand using glue or epoxy for something like this so I retain my PTFE thermal barrier using two M3x20 screws through the base and thermal barrier (perpendicular to the direction of the filament and heater barrel). 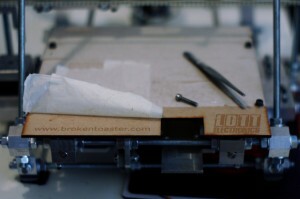 This allows me to swap out extruder barrels quickly without cutting any tape when they give trouble or become blocked. Building a new extruder driver. While I am reasonably happy with my initial prints I have decided to build Adrians geared extruder driver to improve the consistency of the extrusion. 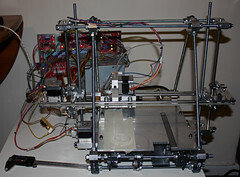 The three photos show my new extruder driver. Although the printed parts look good enough to work in this situation a close inspection of the print show the extrusion tends to “bead” a little and on some prints just stop altogether. I’m hoping a driver with more “torque” will improve this as well as better spool management. I’m also building a new extruder head as well to improve the temperature stability. If anyone has other ideas on how to better improve the print quality of my reprap I’d love to hear about them. After four months of soldering and mucking about with screws and metal things I finally have a working 3D printer. 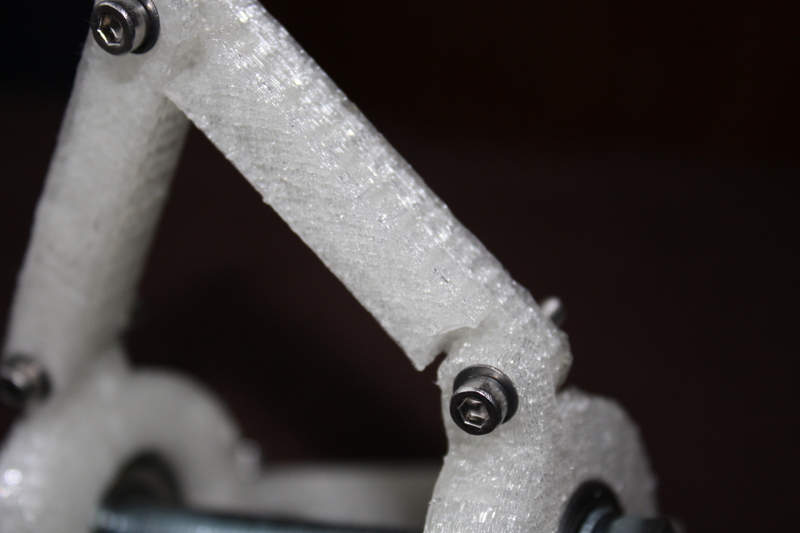 This was built using Makerbot electronics and aluminium versions of the printed parts. I will publish the drawings of the machined parts as soon as I have 1) tidied them up, 2) fixed the mistakes I put on them and 3) confirmed the design actually works. I made a few changes from the designs released in November in order to make them machine-able, but for the most part they are true to the original designs and taken from the STEP files or the STL files converted back into CAD files. I’ve deliberately mounted the electronics in an open fashion on standoffs on an aluminium base plate to facilitate testing as I plan to improve and refine the design. I’d like to improve the electronics, PCB design and location of boards with an eye towards EMC and proper shielding, but for moment they are open to allow scope and multimeter access. I hope to tidy up all the cables into tidy looms and things a bit once I’m happier with the performance and reliability. I had an opto-interrupter board fail on me which resulted in a couple of crashes so I’ve temporarily replaced them with some very cheap push buttons. Probably a short circuit on the veroboard versions I built up, that’ll teach me for being too cheap to pay $1 for a decent PCB. I’m quite glad to notice the latest version of host software is functioning on OS X, it saves me having to boot up windows every time I want to print. I say functioning and not working as it doesn’t quite fit all the controls on the screen nicely and does odd things every now and then. But it is better than it was a couple of months ago and so it is looking good for the future. Sadly I’m off home to NZ for a few weeks so wont get a decent chance to to get it all going properly till the end of the month. On the other hand the software may have moved forward another step by then as well and I might even take the time to read the instructions.